My caffeine receptors are now suitably calmed after a jittery, jaw-chomping evening on Sunday, at the end of a 7hr session at Cafe Kondi. My coffee intake is usually really quite moderate, and I was well aware that I needed to try and pace myself if I didn’t want to end up a quivering wreck – an eventuality that was narrowly avoided! I had a lovely day, with a great bunch of enthusiastic and talented people, who brought a variety of different skills and specialties into the mix. With eleven of us there, it was a better turn-out than I was initially expecting: John of Cafe Kondi (thanks for letting us run riot in your cafe all day, and burn through all your milk – hope we didn’t leave too much of a mess! ), Matt from Beyond the Bean, Tony, UKBC 2008 winner Hugo, and Jack, from Relish in Cornwall, who travelled up with Tristan Stephenson, and also three folks from Extract Coffee roasters (sorry I can’t remember all your names! ), and, of course, Will Thornborough from Cardiff Coffee Company. Various people brought a bewildering array of great coffees along – I won’t even begin to try and list them all – there must have been at least 20 different blends and single origin beans there – most of which we tried in some form or other throughout the day. While we waited for everyone to arrive, we spent a little time getting to grips with the Faema machine, which although not as good as some machines, was so nice, consistent and modern for me compared to our old Ducale at work – apart from slightly irksome steaming wands that seemed to give everyone some jip throughout the day; really great microfoam was in quite short supply! 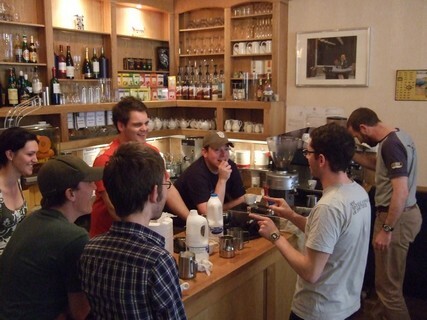 With everyone present we then launched into a winner-stays-on latte art smack-down! Considering this should really have been like my ‘area of expertise’, I feel I let myself down miserably, pouring only one half-decent rosetta, and two appallingly bad ones! Thankfully, people were actually very complimentary towards my better pour, and it was a godsend compared to the other two (even though I was thinking damn it! that’s not great! if only you could see what I pour regularly at work!!). We were all in the same boat though, I’m sure – pressure pours with an unfamiliar machine, cups, steamer and environment rarely allow people to execute their best latte art. Overall, I’d say Hugo certainly justified his title by delivering the nicest, most consistent designs. The milk texture might not have been great either, but I swear the majority of those bubbles were due to the freshness of the beans..! A bit later we ground a selection (about nine) of the coffees on offer, and I was party to my first proper cupping session (it’s annoying how comically lewd that always sounds to anyone outside the coffee world!) other than small-scale ones I’ve done at The Plan occasionally. This was particularly interesting for me, as the cupping/tasting/evaluating side of things is an area I’m not so strong on, and I’m keen to educate my palate more to distinguish the subtle differences in coffees. Even though I was struggling a little to isolate and place the specific flavour characteristics of each coffee, it was great simply cupping so many different coffees side by side – the sheer range of aromas and flavours is a joy to experience, and would confirm coffee’s rich array of varying flavours to anyone that might doubt it’s potential complexity. I particularly liked the Ethiopian, the Kenyan … and whatever was next to the Kenyan, although a couple of the others had a wonderfully zesty acidity that was nice as well. After that, we ran a few of the coffees through the Faema, to try them as espresso, latte and macchiato, one of which had lovely blackcurrant notes as espresso and macchiato, but which were lost a little in a latte. Needless to say, buy this point, we were all getting a bit coffeed-out (the dancing patterns in front of my eyes told me I’d had enough! ), and after a couple of paninis, most of us beat a shaky retreat home. Hi! to everyone I met – I look forward to doing something similar again somewhere in the near future! Next up though it’s probably Caffe Culture in May, where I hope to do the advanced cupping workshop, and certainly check-out the latte art comps with a view to maybe entering next year! This entry was posted on April 29, 2008 at 8:38 pm and is filed under Uncategorized. You can follow any responses to this entry through the RSS 2.0 feed. You can leave a response, or trackback from your own site.